The art of setting goals properly is often what separates the unsuccessful from the successful, and if you want to join the latter then you must follow these five simple rules from Mindtools.com to set your self up for success this New Year. Although this may sound trivial, this rule is usually the first thing that people do wrong. When setting a goal for yourself you have to make sure that it evokes a strong emotional response, otherwise after the initial motivation wears off you will have little keeping you committed to your goal. Try focusing on goals that relate to things that mean the most in your life, whether that is your career, health or family the key is to have quality not quantity. Specific: Your goal must be clear and well defined as it will help you end up precisely where you want to be. 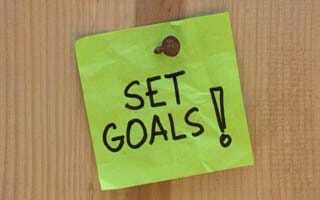 Measurable: With out having a means of measuring your goal, how will you know if achieved it or not? “I want to be wealthier”, is not helpful as a goal but “I will save an extra $100 a month” will help you achieve success. Attainable: All too often we see people “bite off more than they can chew”, and in moments of motivation set their aims too high, it is important to pick goals that challenge you but not too far out of reach otherwise your confidence can take a hit. Relevant: Pick a goal that is relevant to what you want out of life, if you are focused on furthering your career making a goal to master surfing may not be the right one for you. Time Bound: Without a set completion date it will be all too easy to push it off. The act of writing down your goals and placing it somewhere you will see it on a daily basis, turns the goal from a thought into something real and tangible that you will be obligated to. Sometimes when setting goals, we find that people are so excited about the end result they forget about the steps on how to get there. Your action plan is the most important part of your goal, because with out it you will have no clear path of how to reach you desired result. Although this may be obvious to achieving our goals, it is important to set aside time weekly to review your goals and action plan and adjust as you see fit, this will allow you to remain focused on the goal and tailor your plan for optimal chances of success. There may be obstacles in the way of any goal, following these steps allows you to set yourself up for higher chances of success, and in turn put you on a path to a better life.